Cronuts are the latest dessert craze to hit the world. A cross between croissants and donuts = cronuts, they are wonderfully flaky and delicious. Here's how to make your own cronuts. We make a buttery croissant dough which we cut into donut shapes and then fry. The cronuts have a cream or fruit filling and are topped with cinnamon sugar and a sugar glaze. 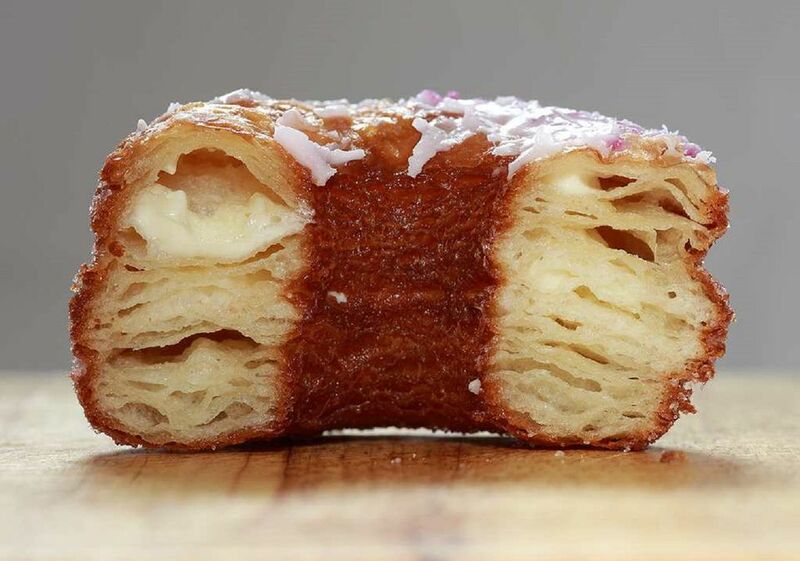 ﻿The original Cronut was invented by Chef Dominique Ansel in his New York bakery. In a large bowl, whisk together the egg yolks, the remaining 1/4 cup of the sugar, flour, and salt. Remove the milk from the heat and slowly whisk it into the egg and flour mixture. When all of the milk has been blended in, add the mixture back into the saucepan and cook over medium heat (whisking constantly) until the mixture is boiling and thick. Stir in the vanilla extract and pour the mixture through cheesecloth or a fine-mesh strainer into a non-reactive bowl. Place plastic wrap directly on the service of the cream so a skin does not form. Add the flour, sugar, salt, and 1 1/2 tablespoons softened butter to a stand mixer bowl. Add the yeast mixture to the dry ingredients and mix with the paddle attachment until just combined about 2 minutes. Scrape down the sides of the bowl and mix again for another minute. Press the dough into a ball and place in a greased bowl. Cover with a damp cloth or loosely with plastic wrap and place in a warm spot. Let rise until doubled in size, about 45 minutes. At this point, punch down the dough, wrap and chill for 1 hour. While you're waiting, place the cup of butter between 2 pieces of parchment or wax paper. Use a rolling pin to flatten and shape into an 8-by-8-inch square. Fold the corners of the dough over the butter block to meet in the center. Use your fingers to pinch together the dough at the seams so the butter block is completely sealed. Roll dough out into a 20-by-8-inch rectangle. If the dough is too stiff, smack it a few times with the rolling pin to soften. Brush off any excess flour and fold the dough into thirds, like a letter. Cover with plastic wrap and chill for 1 hour. Repeat the folding and chilling process 2 more times. Once the dough is chilled after its final fold, roll it out on a lightly floured surface into a 6-by-18-inch rectangle. Use a very sharp knife or pizza cutter to cut the dough into 3 6-by-6-inch squares and stack the squares on top of each other. Roll the dough into a 6-by-8-inch rectangle. All this folding and stacking creates layers and layers of buttery croissant dough. Place the oil in a large pot and heat to 350 F. Fry donuts for about 1½ minutes, flipping them in the oil halfway through until they are golden brown all over. Don't crowd the pan, fry in batches if needed. Place on a paper towel-lined plate to cool. Fill a piping bag fitted with a long narrow tip with the vanilla cream. In a separate bowl, whisk together the powdered sugar and water. Add more water if necessary, but make sure glaze is not too watery.